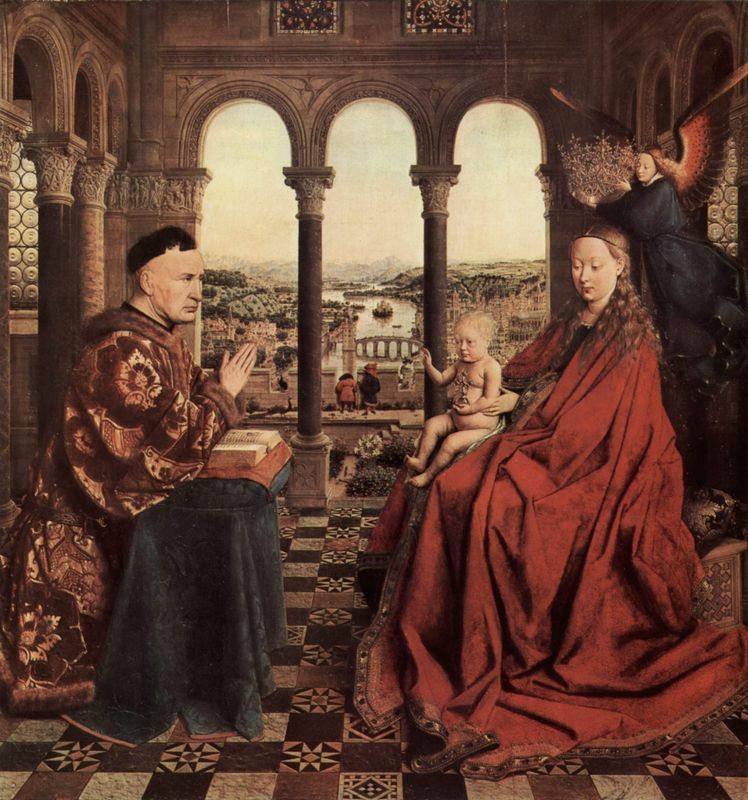 One of Jan van Eyck's most elaborate paintings, The Madonna with Canon Van der Paele depicts the wealthy Canon kneeling before the Virgin and Child. The figures of Saint Donatian and Saint George flank him. 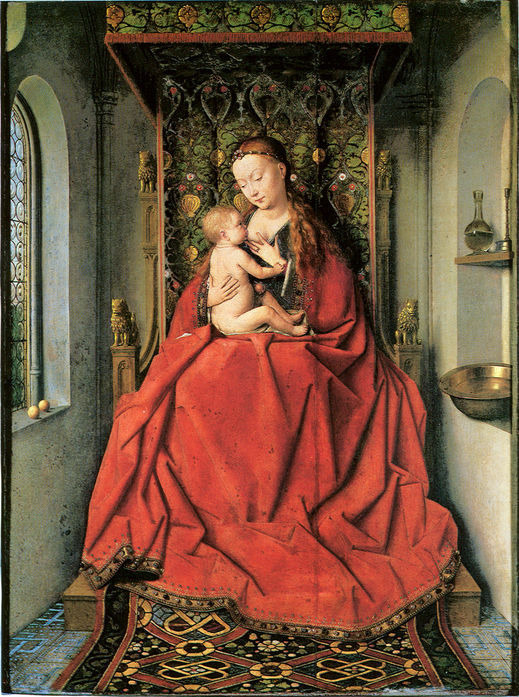 This painting is similar to the Madonna and Chancellor Rolin (see Related Paintings below) in that it presents us with a vision of God in our physical world. Van der Paele has a manuscript in his left hand and his glasses in his right as he probably just finished reciting from the book. Canon Van der Paele is shown in his home environment, his church of St. Donatian, experiencing the divinity of God through Mary and Christ the Child. Flower: Mary expressing her love for Christ by giving him a gift. Salvation: Mary is holding a nosegay and Christ holds a parrot. These items reflect the Garden of Eden. The painting was commissioned, or rather donated, by the Canon Van der Paele for the Church of Saint Donatian in Burges. It is thought that the canon might have hung the painting on the altar of the church. It has also been argued that in northern tradition a painting was usually, if not always, commissioned by the Church to commemorate it in some way and would not be placed inside the altar. Either way the commissioning of The Madonna with Canon Van der Paele was probably an attempt by Van der Paele to improve his divine experience. Another impressive and innovative use of oil paintings, this work demonstrates van Eyck's mastery of indirect light, detail and realism. The light comes into the image from the upper left of the painting. Mary and the Child are illuminated giving them prominence in the scene. The use of indirect light is spectacular - the light hitting Saint Georges' armor is reflected and refracted many times over. With the use of oil paints Jan van Eyck was able to push perspective, coloring and shades of light even further. Layering the paints gave van Eyck almost complete control and allows him to create subtle differences in colors. Also, the oils often act as a glaze which has the ability to trap light which van Eyck takes advantage of by using indirect light and sometimes two different light sources. 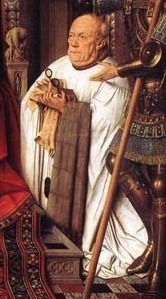 The figure of the Canon Van der Paele is shown as the next point to observe after Mary and Christ. This was probably done to depict some short of ranking as Van der Paele appears to have wanted to be inducted or experience something divine. The surfaces are one of the most intriguing aspects of the painting. The clarity with which we see Saint Georges' armor and from the clothing, to the wood and then back to the clothing - each piece of texture is perfectly identifiable. Here, like with some of van Eyck's other works, the detailed presentations of the religious figures bring the whole scene to life. 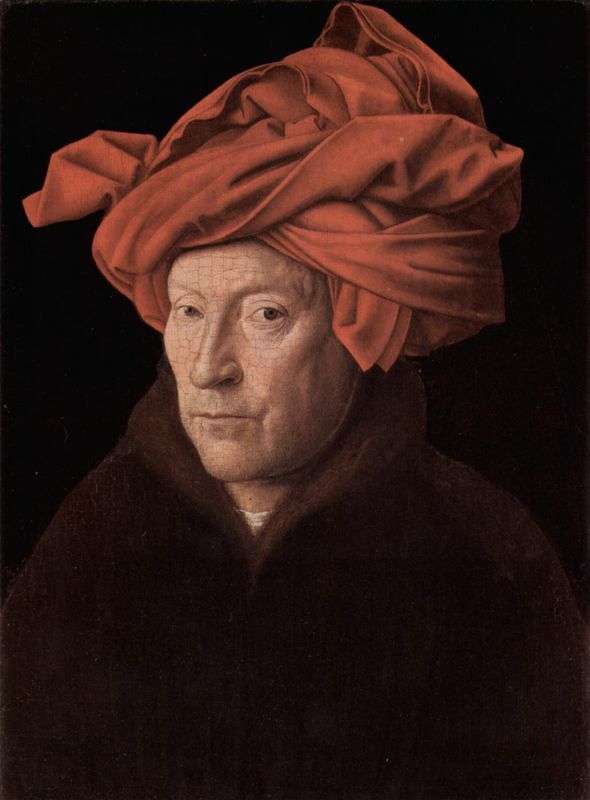 Today van Eyck's technique with oil painting has not been surpassed. In terms of detail and realism, his achievements are unrivalled in the history of art. Although much of his technique has been copied and added to throughout the centuries, his complex use of iconography is still a hot topic of discussion.